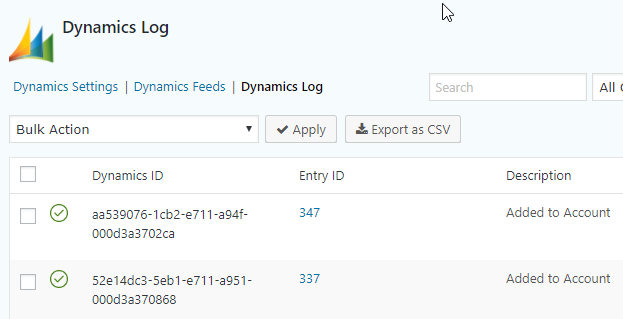 Connect Dynamics crm/Dynamics 365 account to Gravity Forms by simply entering Dynamics crm url and click “Login to Dynamics”. You can add a lead to any campaign in Dynamics CRM/Dynamics 365. A Feed determines how data should be sent to Dynamics CRM/Dynamics 365. You can create multiple feeds & setup conditions for sending entries to Dynamics CRM. If there is an error sending data to Dynamics CRM/Dynamics 365 an email containing the error details will be sent to the specified email. View a detailed log of each entry sent (or not sent) to Dynamics CRM/Dynamics 365 and easily resend an entry to Dynamics CRM. Easily export Dynamics CRM/Dynamics 365 Logs as a CSV file for forecasting, bookkeeping, and accounting purposes. All Gravity Forms entries are fully synchronized with Dynamics CRM/Dynamics 365 entries. If you update/delete/restore an entry that entry will be updated/deleted/restored in Dynamics CRM. By default all entries are sent to Dynamics CRM/Dynamics 365, but you can apply filters & setup rules to limit the entries sent to CRM. You can create and assign a account to any lead in Dynamics CRM/Dynamics 365. You can create and assign a contact to any lead in Dynamics CRM/Dynamics 365.